Promoting better working conditions is an essential part of the UTZ program, and that’s why we require that farms make progress towards paying a living wage to workers. One of the ways we work on this important issue is through the Global Living Wage Coalition (GLWC). In February 2017 the GLWC published its 10th living wage benchmark, a significant step in making sure farm workers are paid a decent wage. We thought it’s time to find out more about these benchmarks. What is a living wage benchmark? A living wage is defined as enough to afford a decent standard of living for a worker and their family, with a little extra ‘just in case’. This amount is very different from country to country, and even region to region because the cost of food, housing and other necessities varies from place to place. So how do you know how much it should be? The living wage benchmarks use research to establish how much a living wage needs to be for a worker in a certain sector in a certain country. The 10 benchmarks published so far cover a range of regions and countries from rural Kenya, to Malawi, Brazil, and the Dominican Republic. Who will use the benchmarks? Once a benchmark is established, farm workers or their representatives can use it to negotiate a better salary with their employer (the farm owner). It makes it easier for auditors of UTZ farms to judge whether a farmer pays his workers enough and, if wages are too low, it helps UTZ farmers to develop a wage improvement plan to increase these over time. Not all countries and regions relevant to UTZ have got a benchmark yet, so there is still a lot of work to do. One of the first benchmarks relevant to UTZ is for Minas Gerais in Brazil – a coffee growing region. The benchmark research looked at the cost of food, housing and other essentials in the region and used these to calculate a living wage. 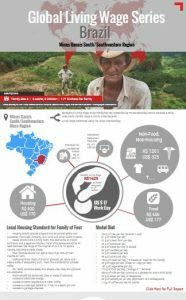 It found that a living wage for workers on coffee farms in this specific region of Brazil would be R$1629 (477 US dollars) per month, compared with the prevailing wage of R$1307 (383 US dollars) per month – meaning work is needed to improve worker wages in the region. UTZ isn’t the only standards organization committed to the living wage and improving workers’ conditions. The GLWC brings together six organizations – Fairtrade International, Forest Stewardship Council (FSC), GoodWeave, Social Accountability International, Sustainable Agriculture Network/Rainforest Alliance, and UTZ – and is facilitated by the ISEAL Alliance. We’re working together to develop a living wage model for each country and then test it on the ground. By taking a shared approach, we hope to speed up progress so more workers can benefit from a decent wage in the future. Read more about why working towards a living wage is important to UTZ in our position paper or have a look at the benchmarks on the Global Living Wage Coalition website.